BenefitsYour brand for a good job! 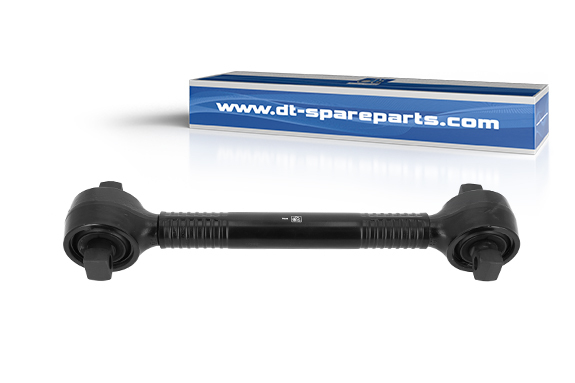 Reaction rods used in conjunction with V-stays take over axle control and thus considerably improve the driving performance of a commercial vehicle. By selecting and assembling the reaction rods in terms of their length, direction and position, the wheel position can be controlled for longitudinal and transverse forces emerging so that only small steering movements are necessary. The 3.66880 reaction rod is made of high quality steel. A hardness test of the metal and rubber parts is carried out according to the DTQS. Proper crimping of the pressed-in joints ensures a firm hold, an optimal vibration behaviour and guarantees high safety. The dimensions of all parts correspond to the specifications of the original manufacturer. Note: Accessories are listed on the respective article detail page in the Partner Portal. The mounting points of the reaction rod must be in contact with the vehicle without corrosion, in order to ensure a stress-free assembly. The clearance of the bearings must be controlled when checking the installed reaction rods. If the clearance of the bearings is too high, the reaction rod must be replaced. All other bearings of the axle must also be checked for their condition. The length of the reaction rod is an important factor because it affects the axle position. Displaced bearings and an incorrect length can therefore influence the wear on the tyres. Directional stability of the axle can be measured and checked by assessing the wheel alignment.